Drawing is what Ramon does. It&sup1;s what makes him happy. But in one split second, all that changes. A single reckless remark by Ramon's older brother, Leon, turns Ramon's carefree sketches into joyless struggles. Luckily for Ramon, though, his little sister, Marisol, sees the world differently. She opens his eyes to something a lot more valuable than getting things just "right." 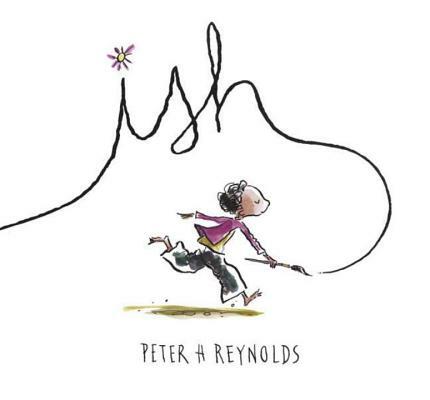 Combining the spareness of fable with the potency of parable, Peter Reynolds shines a bright beam of light on the need to kindle and tend our creative flames with care. person's creativity get shut down," he says. "Through my books, I want to help give kids — and grown-up kids — the vocabulary to protect their exploration, in art, writing, and thinking." ISH . . . encourages readers to see the world anew. Reynold's minimalist pen-and-ink illustrations feature subtle washes of watercolor and ample splashes of emotion and humor. A tidy lesson in the importance of thinking — or drawing — outside the box and believing in one's own abilities despite others' reactions. The overriding theme about creativity versus exactitude will resonate with many. The line-and-clor artwork is simple, but it has great emotion and warmth. Kids will resond to that, too. A lovely tale. . . . Told in spare prose with Reynolds' signature line drawings in watercolor, ink, and tea, ISH will encourage other little artists. Certain to bolster self-esteem and encourage children to follow their creative impulses. Adults as well as children will want to linger over the pages.